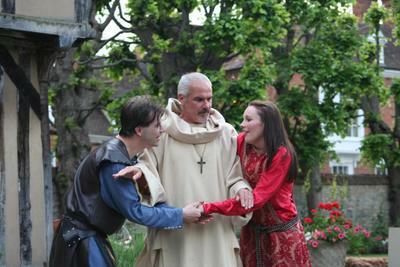 Outdoor performances of The Tragedy of Macbeth will be part of Easter celebrations at The Falstaff Experience as Stratford-based theatre group Caramba stage an abridged version of the classic tragedy. Caramba will carry out three Easter Saturday performances in the yard of the Sheep Street building – said to be one of the most haunted buildings in England – and there will also be quizzes and games for the youngsters. Set up and run by Stratford husband and wife team Tim and Kate Guest, Caramba is well known for its outdoor performances of Shakespeare’s work and have performed many times at the town’s Shakespeare’s Houses. “The Falstaff Experience is a fantastic venue for us,” says Kate. “You actually walk on cobbles that Shakespeare himself would have walked on to get to the bottom of the courtyard where there is a sort of natural outdoor theatre. Performances will be at 1pm, 2.15pm and 3.30pm and admission is £7.50.